Photographer Haley Morris-Cafiero has long been aware of peoples' cruelty towards her based on her size. Living in a society that's obsessed with thinness, life can be hard for larger people, especially women. Morris-Cafiero, however, decided to turn this meanspirited habit into art, and hopefully make people more aware of their judgmental attitudes. 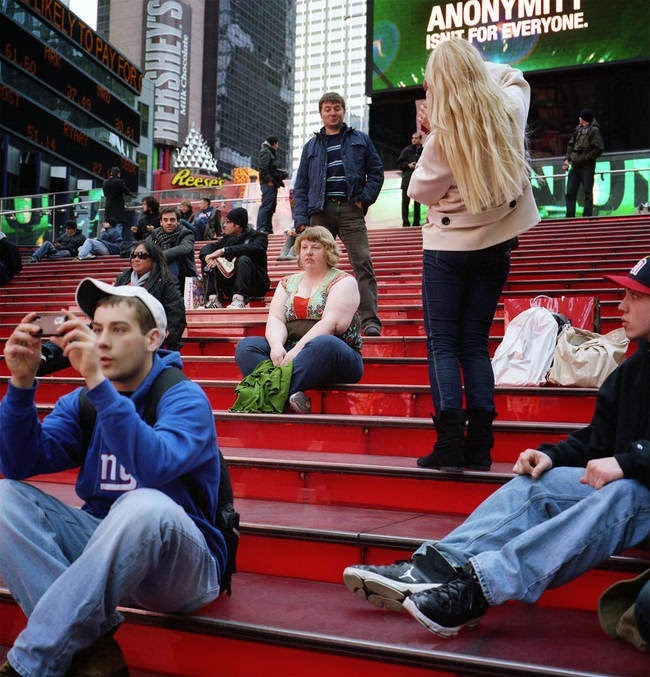 The project became a photo series called Wait Watchers, where Morris-Cafiero photographs herself in public settings, where people, who don't realize they're on camera, can be seen in the background laughing at her or giving her strange looks. And no, she's not doing anything strange, nor is she very obvious about taking the photo. The photos are taken with a self-timing camera, and Morris-Cafiero, once the shot is set up, goes about a normal activity like talking on the phone or seeming to wait for someone. Behind her, you can usually see a passerby giving her the side-eye. The photo that started it all. Here, a man sneers at Morris-Cafiero as she sits on the steps. What he didn't know was that she ended up seeing him, too. Morris-Cafiero, who is based in Memphis, first noticed that she was being appraised by strangers while working on another project. For one of the photos, she took a self-portrait sitting on steps in Times Square. When she looked back through the pictures, she noticed that she wasn't the only one taking pictures. A man behind her was making a face at her while his friend snapped a picture of him. The event stood out to her. "Even though we're in the sensory-overload capital of the world, and he's being photographed, he seems to be fixated on me," she comments. She began to notice the phenomenon in more of her own photos as well. Instead of retreating from the public eye, though, she decided to meet it head to head. She began setting up cameras in public places, and then staging it to look like she just happened to be in the area. The photos capture not only Morris-Cafiero herself, but the reactions of the passerby. "I'm very interested in how society uses the gaze to communicate their emotion, then how we, in turn, interpret the way people look at us," she explains. The Wait Watchers project turns the strangers' gaze at Morris-Cafiero back on themselves, and, she hopes, make people aware of the issues of body image, shaming of larger people, which Morris-Cafiero has experienced first hand. Her work has become somewhat viral online, and, since it's the Internet, the feedback included some not-so-nice comments. People told Morris-Cafiero that "my life, and in some cases the world, would be better if I lost weight and got a makeover." Morris-Cafiero brushes the nonsense off, though. "I don't care what anybody thinks about my body and I'm perfectly fine with it." And you really can't argue that her attitude is anything short of fantastic. "We all know that haters are going to be haters," she says, directly to her audience in the Wait Watchers Kickstarter video, "but as I celebrate myself, I hope you learn to love and celebrate yourself as well." You can see some of the images on her site, and check out her Kickstarter, which will go towards funding the publication of her book. She's also on Instagram and Twitter.